7:30 PM: Withers Hall, Rm 140. Dr. Thompson will screen the film, “Ghosts of Attica,” a documentary that looks back at the Attica uprising and violent suppression with remarkable period footage, shot inside the prison over the course of the four-day rebellion in 1971. Mesmerizing interviews with witnesses tell the unvarnished truth about the past, while an examination of recent legal battles, of both guards and inmates, adds another resonant dimension to the film’s history of Attica. Following the screening, there will be a short Q& A session with Dr. Thompson. Heather Thompson, Professor of History, University of Michigan. “The Attica Prison Uprising of 1971 and Why it Matters Today.” In 1971 nearly 1300 men took over one of the nation’s most infamous prisons, the Attica Correctional Facility in upstate New York. That historic uprising to secure basic human rights was met with deadly force and for the next 45 years the story of how such trauma could have taken place was hidden from the public. Heather Ann Thompson shares the story of this dramatic rebellion, its tragic end, and the depth of the coverup that followed it. Knowing this history, she suggests, shines needed new light on why we have more people locked up in the United States today than any other country on the globe. Thompson, Heather Ann. Blood in the Water. Pantheon Press, 2016. Thomson, Heather. Whose Detroit? Politics, Labor, and Race in a Modern American City. Cornell University Press, 2017. Events are free and open to the public, but registration is recommended to reserve space. Please contact Ingrid Hoffius at ibhoffiu@ncsu.edu (919) 513-2313 with any questions. 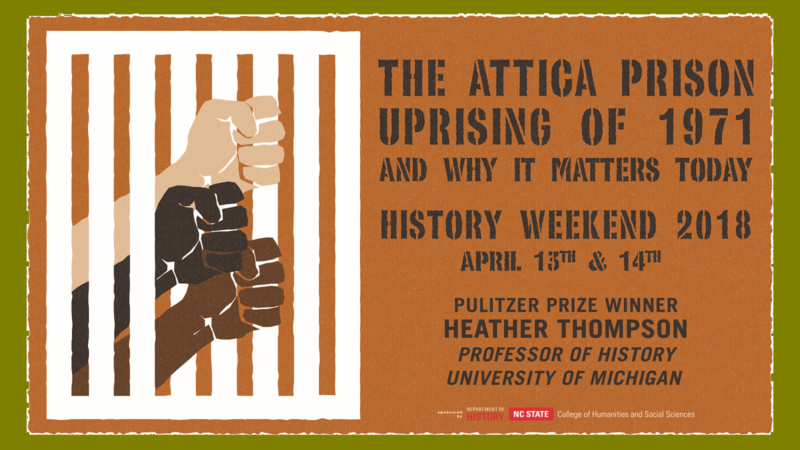 Dr. Heather Ann Thompson is a historian at the University of Michigan, and is the Pulitzer Prize and Bancroft Prize-winning author of Blood in the Water: The Attica Prison Uprising of 1971 and Its Legacy (Pantheon Books, 2016). Thompson is also a public intellectual who writes extensively on the history of policing, mass incarceration and the current criminal justice system for The New York Times, Newsweek, Time, The Washington Post, Jacobin, The Atlantic, Salon, Dissent, NBC, New Labor Forum, The Daily Beast, and The Huffington Post, as well as for the top publications in her field. On the policy front Thompson served on a National Academy of Sciences blue-ribbon panel that studied the causes and consequences of mass incarceration in the U.S. In 2016 Thompson became President-elect of the Urban History Association and, in 2012 the Organization of American Historians named her a Distinguished Lecturer and, along with Rhonda Y. Williams (Case Western Reserve), she currently edits a manuscript series for UNC Press, Justice, Power, and Politics. She is also the sole editor of the series, American Social Movements of the Twentieth Century published by Routledge. By Credit Card: Use our Secure Online Gift Form to make a gift by credit card.